Hello friends, you know very well about the Microsoft Word . MS Word is a powerful word processing application software which can be used to provide error free document from spelling and grammatical errors and also provide different facilities. Today we talk about a one of the most important facility which is known as “ Watermark ”. Watermark is a text or any image that is shown by default on all pages in the active document behind the text. This option gives a different look of your document. You can set, edit, delete, view or print any required text or image watermark in the active document. You can see this watermark either in full screen reading view or print layout view. 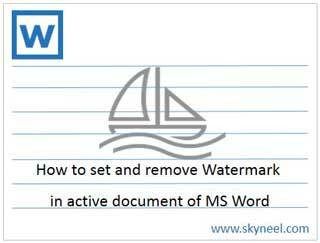 You can easily set Watermark in active document after reading this article. Step 1: Create a new document or open an existing document in which you want to set watermark. Step 2: Click on the Design tab > Click on the “Watermark” option > either you have to click on any preformatted watermark or click on the Custom Watermark option > If you want to set any picture or logo for watermark then select picture watermark option and select any required picture. If you want to set any required text as a watermark then select Text watermark option and type any required text in text box, you can set font, size, colour and layout of watermark also in Printed Watermark dialogue box. Step 1: Open an existing document from which you want to remove watermark. Step 2: Click on the Design tab > Click on the “Watermark” option > Click “Remove Watermark” option. I hope you like this article, give your important suggestions in the comment box regarding this article and also share your knowledge with others. Thanks.